1. Control the evaporator pressure stable to reduce the fluctuation of room temperature. Then, keep the goods fresh and reduce the water losses of goods. 2. Control the evaporator work well while have two or more different evaporating pressures in systems with one compressor. For example, customer ask three cold rooms (-18C for meat , +2C for milk and +5C for vegetable), so there are three different evaporating pressures. To let the three cold rooms can work well in different pressure, we need to use some ways to control the pressure. Now, let us introduce one popular way for control the evaporator pressure. 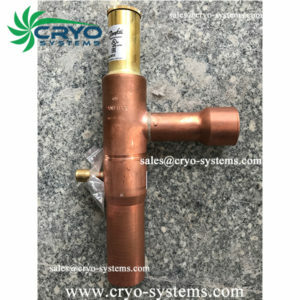 It is evaporating pressure regulator (KVP). The KVP is mounted in the suction line of refrigeration system. As above example, we can install two KVPs in the evaporator outlet pipe of milk and vegetable cold rooms. And, let the evaporators work under the evaporating pressure they need.